Dare #131 is up. Do you collect stuff? There are a lot of things I could have covered here, but I went for all of the short sleeved t-shirts in my closet. I took photos of them in Photobooth, and then did some mad Poladroid-ization on them all. I would have used the real deal, but I'm down to one 10-pack and that wasn't going to cut it. Plus, um, that would have been totally expensive. You can't see it here, but I raided my stash of scraps and used up tons of it to cover the backs of each 'droid. 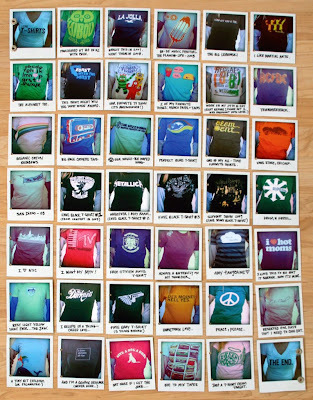 Doing this made me realize that all my t-shirts have some sort of story or memory associated with them. Noted on each one with a Sharpie. Funny how I can remember what store they're from or who I was with when I bought them or something I did the first time I wore them. I know, they're just t-shirts. But so part of the every day. T-shirts that have been with me on vacations, to concerts, lost and then found again, some that should be retired, some too small, some too big, and some that are just right. brilliant. i love tees too and this book just takes the cake. love its chunky format. i LOVE the idea of a droid mini! DUDE. you are SO good. this is so cute! love it. just realized i kinda miss ya....hmph. (-: i'll be sending ya a 'hi' email soon! this is soooo dang cool. what a cute idea - i love it! and your t-shirts are all so unique and cute! love your t-shirts, especially the ac dc one, and the darkness, and the vans one....no i can't choose! dude...brilliant! and thanks for telling me about the poladroid thing. i'm totally addicted now! added some fun ones on my blog if you wanna stop by for a peek! lol. You have quite a t shirt collection there dear:) Love it though and I am a little envious, interesting and cool T shirts are addicting. I love it!! Especially the Yo! Gabba Gabba! shirt.